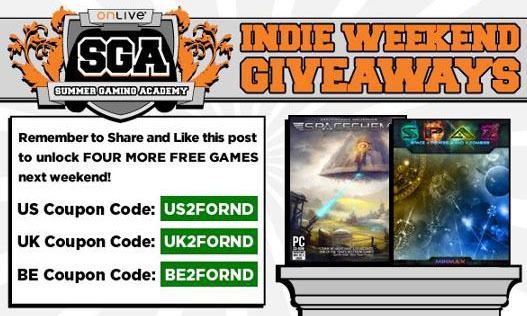 As part of their Summer Gaming Academy, OnLive is running a promotion named Indie Weekend Giveaways for the last three weekends of August with this weekend being the second of them. Last weekend OnLive gave away Zeno Clash for free and asked gamers to reach the goal of 1,000 shares of the free Zeno Clash Facebook announcement and they’ll unlock not one, but two free indie games this weekend. Well, OnLive surpassed that goal with ease as they have to date accumulated 3,694 shares. 1. Follow the links based on your region. 2. Follow the instructions on the code redemption page. 3. NOTE: In order to claim both games, you must go through the web redemption process twice. Click the “Redeem another game” link to redeem your second game. WARNING: These codes will not be redeemable in the OnLive service. They are only fully redeemable through the links above. Of course if you want to play the games you have to launch the OnLive service. And as last weekend OnLive has another challenge. If they get 2,000 shares and 2,000 likes of the free Space Pirates and Zombies (S.P.A.Z.) and SpaceChem Facebook post, they will give out for free 4 games next weekend! And don't forget to like OnLive on Facebook for giving you free games! I think I know why OnLive can give away so many free games. These games are in the OnLive PlayPack anyway and make most of their money from the PlayPack, so it doesn't matter to the publishers of the games. And such giveaways are great promotions for OnLive, the PlayPack and of course the games given away for free. And looking around the internet confirms that this giveaway really is a great promotion. OnLive also did a quick Q&A with the developers of both games and you can read it below. 1. Explain S.P.A.Z. in one sentence or less. SPAZ is an action RPG with fully upgradeable space ships and a tech tree, set in a universe where you have a front row seat to an emerging zombie apocalypse. 2. MinMax has had an interesting start with the team coming from a larger developer and working on Scarface 2. What are some of the things you weren’t ready for when you started your own company? MinMax is a two person company, consisting of Richard Clifford and Andrew Hume. We worked together at Radical for about 5 years prior to leaving AAA development. We initially left AAA development because projects that we had worked so hard on and loved could be cancelled seemingly out of nowhere at the whims of random and faceless executives. Beyond that, we regularly saw large numbers of employees being culled from teams so we had no sense of artistic or job security. In a business where you work so hard for very long hours and comparatively little wage, having a rug that can be pulled out at a moment’s notice was just too much for us. Then we moved on to indie development, mostly as a last ditch effort to still make the games we loved while having some level of control over our destinies. We now had complete control over our game, but this came at the price of no financial security whatsoever. SPAZ was made on a shoestring budget from our savings. It was originally to be a 6 month project, which developed into a 2 year marathon, leaving us weeks from bankruptcy. In the end we needed to release the beta pre-order to stay afloat. Scary times indeed! 3. What has been the reaction from gamers? The reaction really took us by surprise. We made SPAZ as a game that we wanted to play instead of a game designed to appeal to the widest audience possible. The gamble was that there were enough people out there like us who weren’t getting games built for them anymore. We were nervous about this for most of the project. We worried that peoples’ tastes had shifted and we may only make a few thousand sales, but we had to finish SPAZ, if only to play it. Since day one of the Beta, fan reaction has been very good. We still receive emails thanking us for making SPAZ. Reaction is not all positive of course and some people really hate the game and find it too difficult. SPAZ is designed to let you try novel strategies and get in over your head if you are not careful. It has lots of sharp edges, which no longer exist in most AAA development, instead usually opting for an assessable 8 hour ride on rails. In SPAZ you need to think instead of just experiencing the game, and if you don’t, you are punished. So for some, they absolutely love it, and for others they find it a grindy punch in the face. We obviously made SPAZ for the first category of players, since they are sorely lacking for content these days. The reason SPAZ has sold well has turned out to be this category of players. They are a small piece of the gaming pie, so AAA developers ignore them. But since they are ignored, there is also very little competition to provide games to them. When a game like SPAZ comes out, they are very loyal and purchase it, hoping to see more in the future. 4. If you were to give advice to other independent developers, what would that be? Whenever you plan, assume everything will take three times longer than expected. Assume that you will need to localize your game from the beginning, and stay in close contact with your community. Their ideas are often better than your own. 5. What’s next in the S.P.A.Z. Universe? SPAZ 2 is in pre-production now, meaning trips to the pub talking about random ideas. We will be supporting co-op multiplayer in SPAZ 2 as well. Right now, we plan to continue the SPAZ 2 story where the current game leaves off. We are already extremely excited about SPAZ 2 and wish we could play it. We learned so much from the SPAZ community and our own hard lessons that we want to apply. 6. What are your thoughts on cloud gaming? It is such a cool innovation and solves a lot of PC gaming problems. My jaw dropped the first time I tested out OnLive. One of the most difficult problems on the PC is hardware compatibility. Everyone’s PC is just slightly different than everyone else’s, and beyond that they all have different virus scanners and random programs running that can cause random and nearly impossible issues to find. When your game is on a cloud service, it works or it doesn’t. Everyone uses the same hardware. Phew! In the future with lightning fast internet, cloud gaming seems like an absolute no brainer. I would much prefer to even pay for a monthly service where my compy is just a terminal connected to the latest and greatest tech. Cloud gaming has to become the standard in the next few years. This may represent a resurgence in PC game development as well. Currently many AAA developers do not bother with the PC due to piracy rates, but on a cloud system, piracy becomes a non-issue as does multiplayer cheating. It is a pretty slick solution that may bring PC gaming back to the forefront. That or cause a blurring of PC and console gaming, where our PC’s are really just terminals. 7. Where would you like to see cloud gaming? What features do you envisioning coming down the pipe? Faster internet will resolve a lot of the issues we see with lower end connections. I personally use a 6 MBit connection so am poverty stricken bandwidth wise. Once 20+MBit becomes the standard then there will be no reason to not play everything through the cloud for me. Multiplayer seems like something cloud computing would excel at and should pursue with vigor. It is great to know that you are on an even playing field. Everyone has the same tech, and no cheats. They could go so far as to matchmake by ping. 8. Why are you giving your game out for free on OnLive? We want to spread awareness about SPAZ. We never really had a marketing budget, and we really do want people to enjoy our game. SPAZ is now profitable, but of course hopefully this promotion translates to some more sales as people tell their friends about SPAZ as well; this has always been huge for us. Often people even buy SPAZ for friends, which is just great. In the end though, we see cloud gaming as the future. OnLive is the ranger breaking the trail for everyone else, so we want to do our part to help. Both of us at MinMax hope that you have a ton of fun with SPAZ, and we hope to see you all playing SPAZ 2 in the future! 1. Explain SpaceChem in one sentence or less. SpaceChem is an intense, design-based puzzle game about atomic machinery, fake science, and space monsters. 2. Where did the idea of SpaceChem come from? SpaceChem is essentially an expansion of a Flash game I made a long time ago called The Codex of Alchemical Engineering. When I visited Gas Works Park in Seattle I realized just how cool chemical pipelines could be and started thinking about an idea for a game that eventually became SpaceChem. 3. It’s been over a year and a half since SpaceChem has been released. What are some of the biggest hurdles you’ve faced while developing and supporting SpaceChem, being an independent developer? It was a little tricky getting SpaceChem “out there” at first, but after lucking out and getting on Steam everything took off on its own. For most independent developers, I think this is often the most difficult part. 4. How did Zachtronics get its start? The history of Zachtronics Industries closely follows my personal growth as a game designer, from amateur Flash games, to our first commercial release (SpaceChem), to the small, dedicated game studio it is today. 5. How important is cloud gaming? Where do you see cloud gaming going in the future? I think what we’re seeing now is just the tip of the iceberg, and I can easily imagine some incredible future scenarios. However, I suspect that the future of cloud gaming mostly depends on whether or not internet infrastructure and rendering servers can outpace individual gaming hardware. 6. What is next for Zachtronics? We hear you will be at PAX? Indeed! We’re going to be set up at PAX to host a few small SpaceChem tournaments and show off a new game that we’re almost ready to announce. 7. Why are you giving out your game for free on OnLive? Because everyone loves chemical engineering and programming!